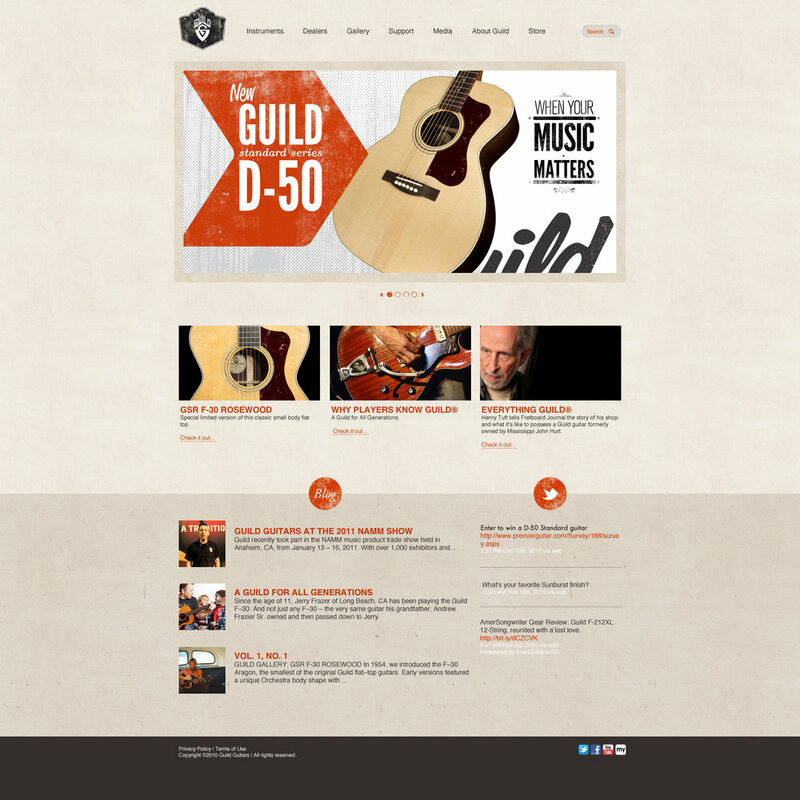 Guild guitars needed a brand refresh. Guild is an admired American musical instrument brand, with roots going back to the early 1950s. Guilds have a reputation for being no-fuss, professional-grade instruments. 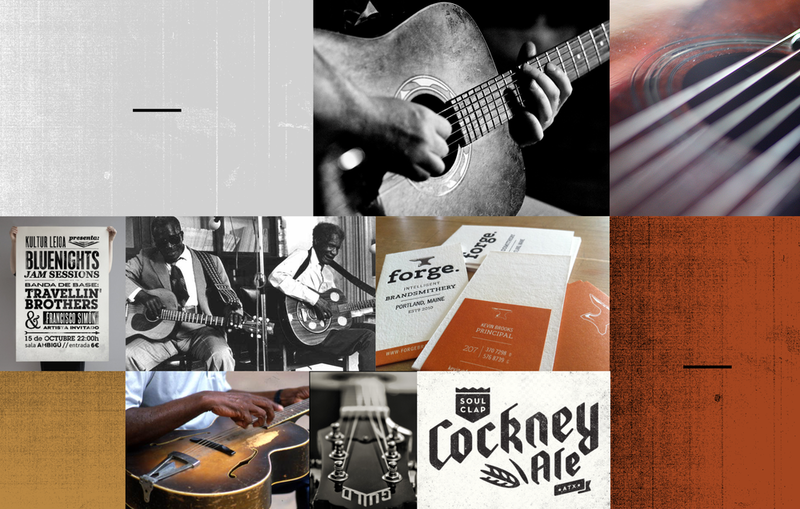 I created and developed the concept of “when the music matters” for Guild, to speak to the brand’s history and heritage as a no-nonsense, working musician’s instrument of choice. Guild guitars have long had a reputation as a working man's alternative to other (more expensive) brands. We wanted to embrace and then double down on that reputation. We felt like the brand had gone through many transitions–in ownership, location and product line–and it was time to get back the brand's roots. Image from Reverb. Click it to learn more about Guild's history. Whenever I start a branding project, I like to take words and turn them into visuals that support the message (mood boarding). This visual research was really the beginning for how I thought about the Guild rebrand. There was a lot of thought put into how we might couple a strong brand statement with this "return to our roots" imagery. I explored options, and ultimately landed on the concept/visual of "when the music matters". Some early exploration around possible designs, incorporating our brand statement. I also explored textures and visual elements that could be used (and re-used) throughout our material to bring a sense of continuity. The brand statement encapsulates everything we wanted the brand to stand for: that these were the tools musicians would use that helped them say what mattered to them. The concept would easily reach to several subjects–music, songs, craft–and so the creative could work on multiple levels for both lifestyle and product-centered campaigns. Accompanying artist and handcraft imagery was chosen to reinforce this. As we worked through our branding concept, I collaborated with our internal web team to produce a mockup of a website that would align with the brand vision. This mockup was produced by my colleague Mike McCurry. Mockup image courtesy my colleague Mike McCurry. Over time, brand touchpoints would have been extended to other avenues, such as clothing and collectibles gear in addition to print and online media.